Wright was instrumental in fashioning a specifically American tradition of modern decoration upon which American Art Deco was built. This is particularly true of the horizontal style of domestic architecture created in the first two decades of the 20th century. Most of it inspired by both European Modernists and the practitioners of the Moderne America. Frank Lloyd Wright received his architectural education in the Chicago office of Louis Sullivan, a pioneering theorist of functionalism. The influence of Sullivan’s organic forms is apparent in Lloyd Wright’s designs and writings. Between 1901 and 1913 Wright designed a series of ‘Prairie Houses’. His prairie houses combined low geometric forms and spaces with stylised ornament. While his Unity Temple of 1906 stands as one of the pioneering examples of Modern American decoration. From 1905, after visiting Japan several times, Wright designed Midway Gardens in Chicago (1913-14). Although later demolished Midway Gardens marked a move towards a greater decorative emphasis in his work. Work which was typified by the Imperial Hotel In Tokyo (1919-21) and the Barnsdall House in Los Angeles (1916-22). 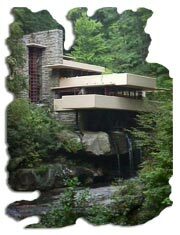 At all times, natural setting was crucial to Frank LLoyd Wright designs. Although Lloyd Wright remained intellectually aloof from what became known as Art Deco, he shared its roots in Vienna and was living proof that America did have a tradition of Modern decoration before 1925.